“Ray-Ban Never Hide Sounds 2013” is an extension of Ray-Ban’s ‘Envision Campaign’ which celebrates the Never Hide spirit: the boldness to be yourself and freely express your beliefs and personality. 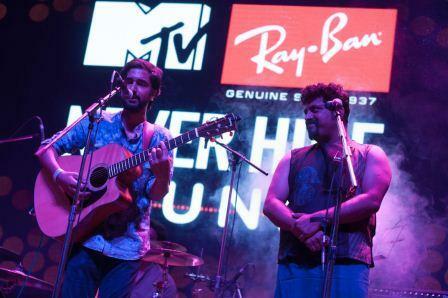 This year “Ray-Ban Never Hide Sounds 2013” in association with MTV will witness selected bands from various genres, perform across cities such as Delhi, Mumbai, Kolkata, Hyderabad and Bangalore. ‘Parvaaz’ -The Bangalore based rock band music can be described as a tasteful blend of blues, elements of rock and the experience of psyche Delia through Kashmiri and Urdu lyrics. The songs explore abstract experiences, ideas and also traditional literature through Kashmiri and Urdu poetry. The Band’s first EP “BEHOSH” was released in July 2012 to become the top selling artist/ album on “OK LISTEN! The track BEHOSH topped the charts on India’s leading music website NH7. Parvaaz is currently working on a full length studio album. A single- “Khufiya Dastaan” was released recently to promote the upcoming album. The band was mentored by Raghu Dixit, a renowned folk singer. The Raghu Dixit Project, founded by Raghu Dixit (Kannada) is an open house for musicians and artistes from different genres to come together, collaborate and create a dynamic sound and expression. He was a gold medalist in Masters in Microbiology and a proficient Indian Classical Dancer (Vidwat in Bharatanatyam). As the founder-front man of his band Antaragni for more than eight years, Raghu’s singing style is inserting Indian ethnic folk, Sufi and classical phrases cleverly into his songs. Talking about the event, Shirley Gong, Ray-Ban Business Manager, Emerging Markets said, “Ray-Ban Never Hide Sounds is taking the next step forward, and we are very excited to announce Edition III in 2013. This year we set out to search the most unique and talented voices around the country and believe that the latest edition is sure to reach greater heights”. After the city events the grand event will take place in Mumbai on November 30th, 2013. The selected bands through Ray-Ban Never Hide Sounds get an opportunity to perform with the renowned mentors and feature in an exclusive TV series on MTV. This entry was posted in Trending News and tagged RAY BAN ANNOUNCES NEVER HIDE SOUNDS 2013.